The aim of the present study was to investigate the effects of 2,3,4′,5-tetrahydroxystilbene-2-O-beta-D-glucoside, an active component extracted from Polygonum multiflorum, on pressure overload-induced cardiac remodeling in rats. A rat model with cardiac remodeling was induced by abdominal aortic banding. 2,3,4′,5-Tetrahydroxystilbene-2-O-beta-D-glucoside (30, 60, 120 mg/kg/day) was administered 3 days after abdominal aortic banding and continued for 30 days. The abdominal aortic banding-treated rats had significantly elevated blood pressure, left ventricular hypertrophy, and myocardial fibrosis. Left ventricular hypertrophy was characterized by an increase in the ratios of the heart and left ventricular weights to body weight, and increased myocyte cross-sectional areas, hypertrophic ventricular septum, and left ventricular posterior wall. The accumulation of myocardial interstitial perivascular collagen and elevated cardiac hydroxyproline content indicated myocardial fibrosis. The pathological changes above were attenuated by 2,3,4′,5-tetrahydroxystilbene-2-O-beta-D-glucoside. Additionally, it markedly reduced collagen I and III expressions and regulated matrix metalloproteinase-2,9 and inhibitors of metalloproteinase expressions, as markers of myocardial fibrosis. Furthermore, we explored the underlying mechanisms for such effects of 2,3,4′,5-tetrahydroxystilbene-2-O-beta-D-glucoside. 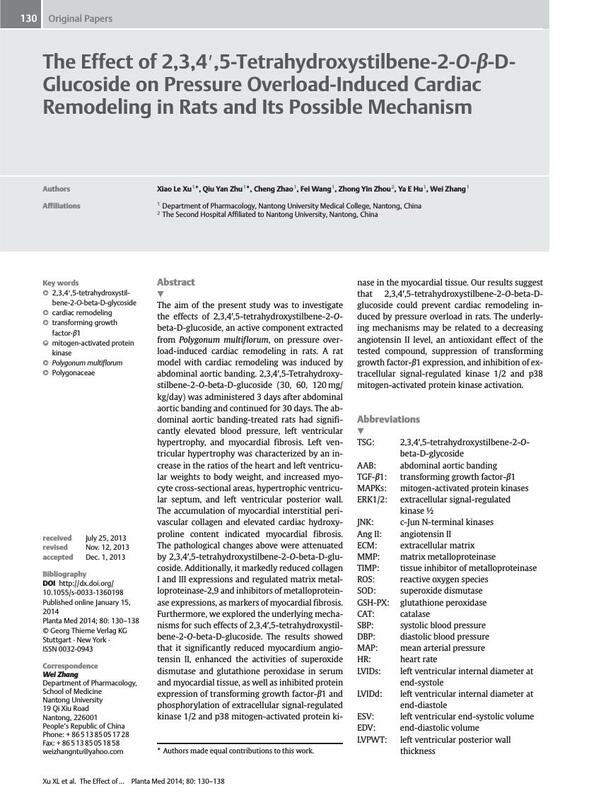 The results showed that it significantly reduced myocardium angiotensin II, enhanced the activities of superoxide dismutase and glutathione peroxidase in serum and myocardial tissue, as well as inhibited protein expression of transforming growth factor-β1 and phosphorylation of extracellular signal-regulated kinase 1/2 and p38 mitogen-activated protein kinase in the myocardial tissue. Our results suggest that 2,3,4′,5-tetrahydroxystilbene-2-O-beta-D-glucoside could prevent cardiac remodeling induced by pressure overload in rats. The underlying mechanisms may be related to a decreasing angiotensin II level, an antioxidant effect of the tested compound, suppression of transforming growth factor-β1 expression, and inhibition of extracellular signal-regulated kinase 1/2 and p38 mitogen-activated protein kinase activation. * Authors made equal contributions to this work.